Book this cruise by February 16, 2019 to receive a special Valentines Package - Take your Sweetie to Tahiti! Receive $200 per couple spa credit plus one bottle of wine and a box of chocolates. When you book with Cruise & Travel Experts, you will also receive an exclusive host, reduced fare, $400 Onboard Credit per couple or a complimentary excursion, and Kids sail free or third adult in stateroom sails at a reduced rate in select staterooms. 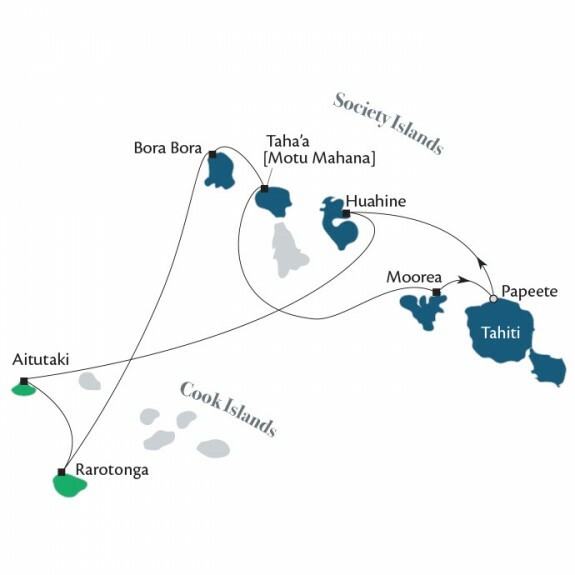 Fares below include economy class airfare from Los Angeles, California to Papette, Tahiti. Receive $200 per Couple Spa Credit, Bottle of Wine & Chocolates plus Exclusive Host, $400 Onboard Credit and Kids Sail Free! Hidden beneath the emerald foliage on the “Garden Island” of Huahine, you’ll find hidden temples surrounded by rare orchids, ancient archeological sites, and panoramic views that are sure to take your breath away. What more could you ask for? Spend two long, luxurious days in storied Bora Bora. You’ve seen the photos and magazine covers, but the real deal is even more beautiful that you could have ever imagined. Take it all in with a dip in the lagoon, an ATV adventure, or a sunset sail. Prices are per person, double occupancy. Port, security, and handling fees are additional. Single supplement pricing is available upon request. Economy class airfare from LAX to Papette, Tahiti is included in above price. Air add-ons from home city is available. Air credit for non-use of included airfare varies. Kids sail FREE/third adult sails at a reduced rate is capacity controlled. Third passenger 17 years or younger sails free. Third passenger 18 years or old sails at $125 per night plus all applicable taxes. Third passenger does not receive the airfare promotion. All promotions can be pulled at any time without notice. For wine and chocolates promotion, reference SWEETIE19. Not all promotions are combinable. Other restrictions may apply.